For no other reason than we felt like it, we decided to have lunch at the Country Deli down the road in Chatsworth. Lunch at the Country Deli is $20.00 per serve with tax and tip. Since we had some ground pork left in the Prather Ranch delivery we decided to do a repeat of the Stir Fried Shanghai Noodles with Ground Pork and Cabbage, which makes four generous serves. 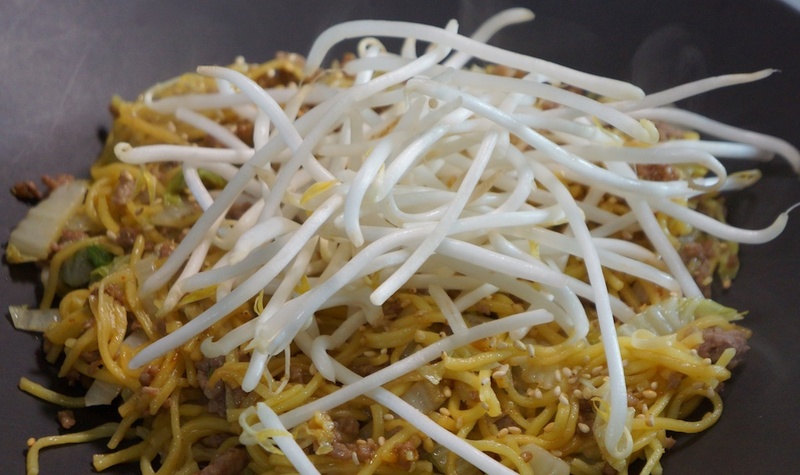 The mung bean sprouts add a nice crunch and a refreshing wetness. The mung bean sprouts are $1.49 and we used 1/3 or 50c per serve. The napa cabbage cost 79c or 20 per serve. Dinner tonight cost $4.20 per serve for a filling and very tasty dish. Another visit to a recommended Mexican take-out in Chatsworth to explore their menu. We mixed it up by buying a carnitas burrito and carnitas chimichanga. Deep frying doesn’t add anything positive to the taste or texture! Lunch today was $7.00 a serve with tax and tip. On what we hope is the last night of this particular heat wave, a salad was definitely called for, and what better than a Cobb? Blue cheese crumbles are $3.49 for the pack and we used about 1/3 or 58c per serve. You can tell by the deep gold yolk that these are pastured eggs: 50c each -one per serve – but worth it for the taste. Avocados are 65c per serve. The organic baby plum tomatoes were $2.79 for the pack or $1.40 per serve. Add 10c for the greens. 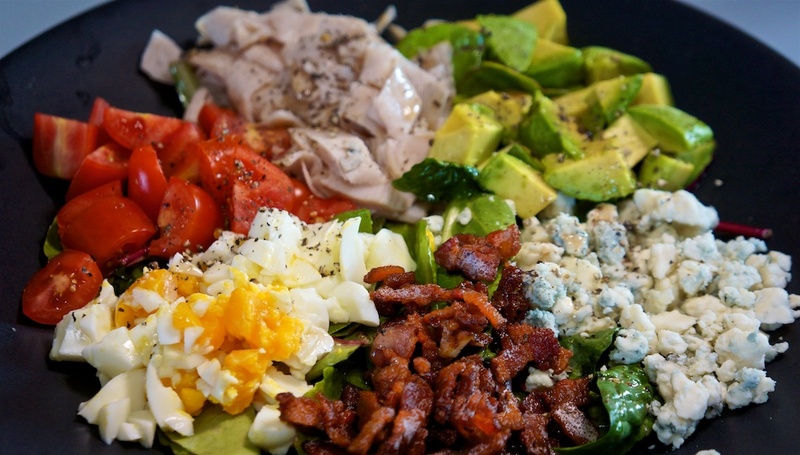 Tonight’s Cobb Salad cost $5.08 per serve. Each slide of the cooked gyro meat is $1.00 per serve. We served 1/4 of the tabouli salad or 67c per serve. 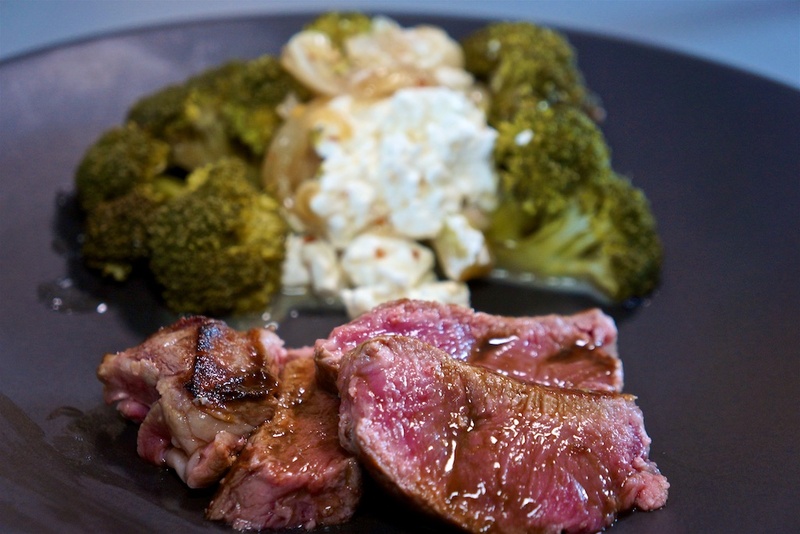 New York strip steak from our Prather Ranch delivery, with slow cooked broccoli. The broccoli takes on an entirely different character when slow cooked with onion, and the feta added at the end adds a creamy overlay while the red pepper flakes give it an appealing heat. You’ll notice the rash of feta-based recipes. Once the Valbreso tin is opened, it needs to be used before it goes off. That’s a possible downside of truly natural ingredients: they will spoil. The Valbreso feta is $9.99 for a 600g tin, of which we used 1/6, or 83c per serve. Dinner tonight was a great balance and cost $11.92. You should give the slow cooked broccoli a try, even if you think you don’t like broccoli. Gyro meat was back on the shelves at Trader Joe’s so, since it’s tastier than chicken, that was our choice. The fully cooked sliced gyro/yeros meat is $3.99 per 10oz pack. There are really four serves, so each serve is very slightly cheaper than the chicken, at $1.00 per serve. Tonight was LACPUG night which culminates with pizza at Palermo’s on Vermont in Los Feliz. Decent pizza, great company. We each contribute $5 per person to cover pizza. This is our first, and probably only, evening meal out this month. No roasted chicken available at the supermarket, so we opted for pre-cooked, pre-sliced turkey breast, with the left over Edamame, Quinoa and feta salad. Hummus is $3.99 per container and we used about 1/6 or 33c per serve. Lunch today cost $3.69 per serve, although there was way too much salad for the wrap, but it was delicious. 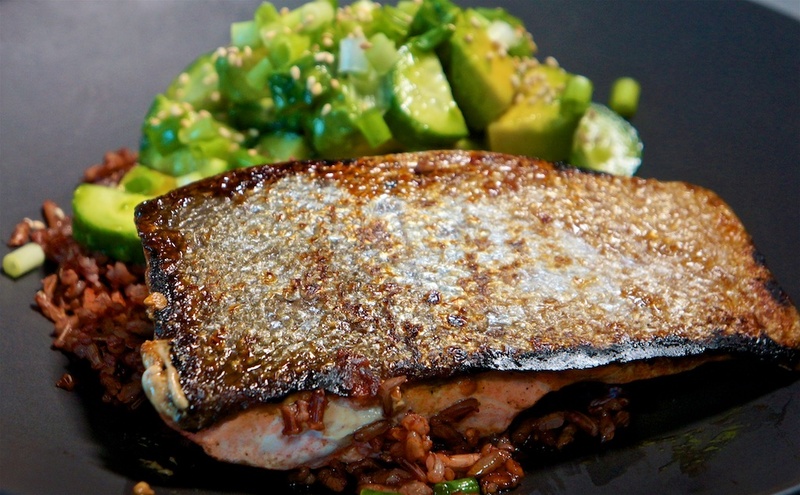 Since wild caught, sockeye salmon was on special we decided to build a meal around it, by modifying a ‘rice bowl’ recipe, which is a simple red (Spanish) rice base, with a cucumber and avocado topping. The avocado and cucumber were ‘marinated’ in rice wine vinegar, which enhanced the cucumber flavor and counterbalanced the fat in the avocado. The salmon was pan seared to crispen the skin, then finished in a hot over to cook the salmon. A little teriyaki was added to the pan just before serving. Add 15c for rice wine vinegar and teriyaki sauce. Dinner tonight cost $6.43 per serve. Another Burbank Monday, and In and Out Burger for Foodie Philip. Foodie Greg had left-over rissoles and salad already accounted for. Lunch today cost $4.03 with tax. Because Quinoa puffs up so much during cooking, we had a lot left over from the salad last night. 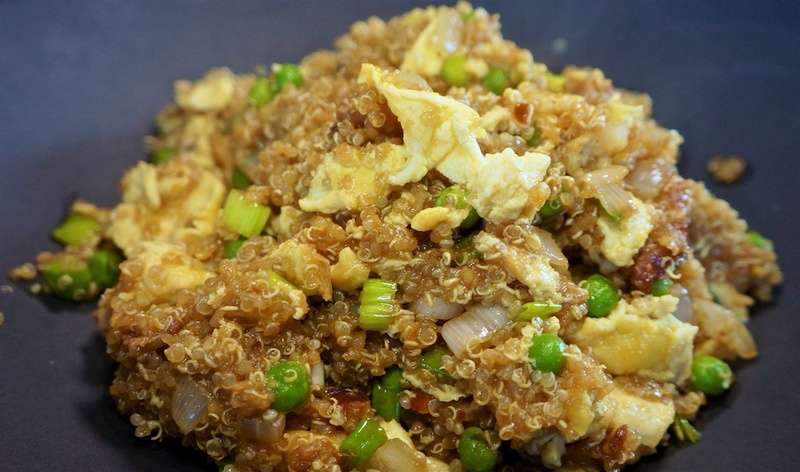 Since we’d enjoyed a Cauliflower ‘fried rice’ in the past a similar experiment with quinoa seemed like a good idea. It was a good idea. Very tasty. Three generous serves resulted. Onion, ginger, spring onion, soy and other ingredients add another 45c per serve. Dinner tonight was very tasty and filling for $2.69 per serve. A lazy Sunday so we opted for sushi from a nearby Whole Foods. Lunch today cost $11.69 per serve. 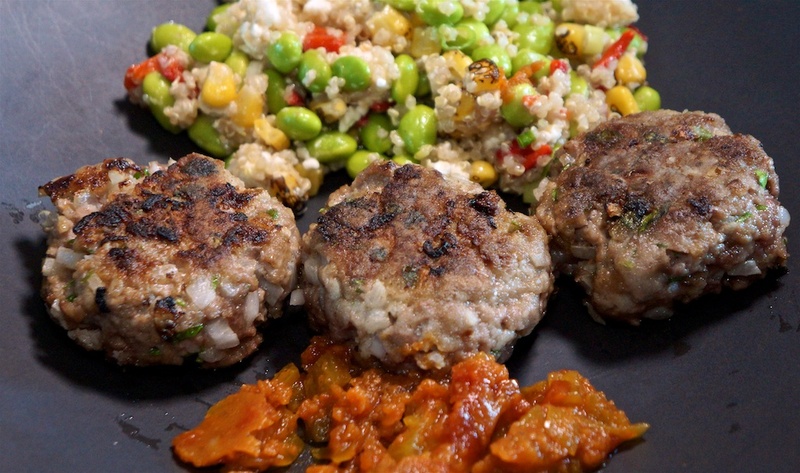 An Australian classic, rissoles are like individually fried, tiny meatloaves! Lots of that loverly outer crust gets formed! Served with a salad from cooked edamame, quinoa that was cooked earlier in the day, and – of course – more of that Valbreso feta! The recipe makes four serves and is based on a lunch salad we used to buy at Sprouts. The ground beef came direct from the farm in our Prather Ranch meat delivery. A pack of fire roasted corn kernels is $2.49 but we used about 1/4 of the pack, or 16c per serve. The salad was really good and we served the rissoles with a little of my brother’s home-made tomato relish, another Australian classic. Dinner tonight cost $7.13 per serve. We still had the lavash flat bread, but as we’d run out of chicken and gyro meat, it was time for a tuna salad (tuna with a little mayonnaise, capers and cucumber) with arugula in the wrap. Add 30c for arugula and the seasoning. Lunch today cost $1.39 per serve. 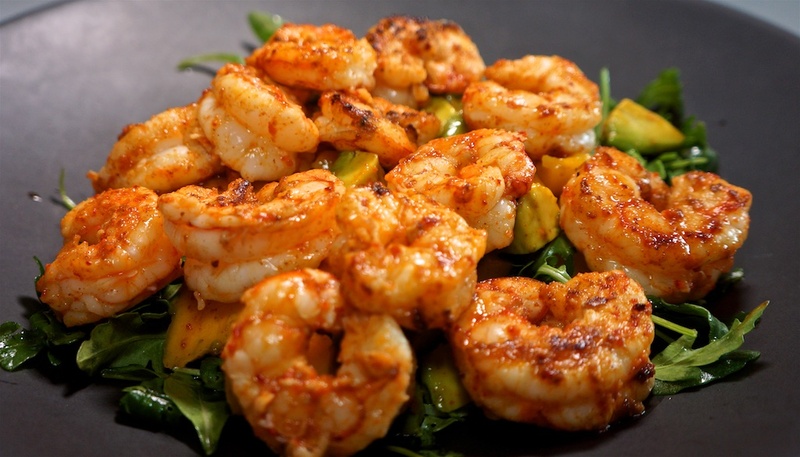 A simple salad of avocado, mango and arugula with chili-lime shrimp was perfect on a hot day. Last time we used a mango it came from Whole Foods and was a big disappointment because it was completely tasteless. Today’s mango came from Smart and Final and was full of flavor and half the cost! Add 15c for the chili lime seasoning for the shrimp and salad. Dinner tonight was $9.50 and a great meal with a very generous serve of shrimp. Time to check out a recommended Mexican take-out in Chatsworth by ordering a favorite: Huevos Ranchero or Rancher’s Eggs. Thursday night is traditionally our steak night, but this week we’re off by one day! Fortunately cooking on the griddle over the induction cooktop doesn’t generate much heat, and a salad requires no heat! 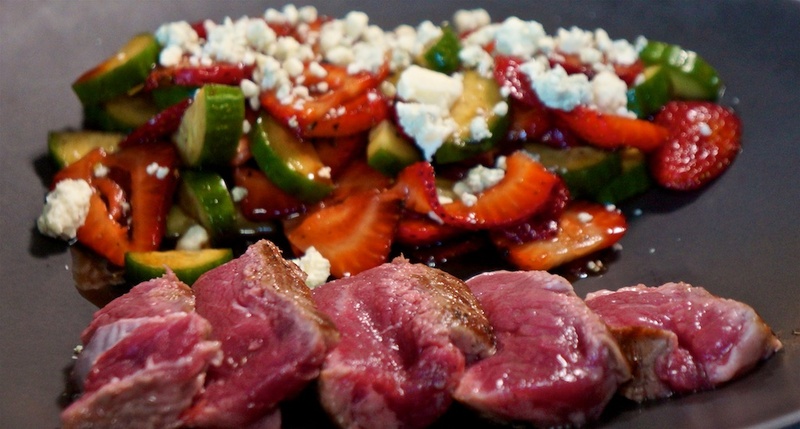 The Balsamic Strawberry and Cucumber salad has been a long time favorite of ours. We had it sufficiently often that Foodie Greg became bored with it, so it’s been a while! Marinating the strawberries in the balsamic vinegar transforms them. The cucumber and blue cheese bring perfect balancing notes. As usual, we prepare these dry aged, organic steaks with just a sear to the outside. That also keeps the amount of heat generated to a minimum. Add 20c per serve for the balsamic vinegar. Something different was called for when we discovered we had a ripe avocado in the fridge. The secret to the success of this meal was Trader Joe’s Chile Lime Seasoning Blend which is amazingly good. We can’t wait to try this on watermelon! Add 20c for arugula and the seasoning. Lunch today cost $1.45 per serve. 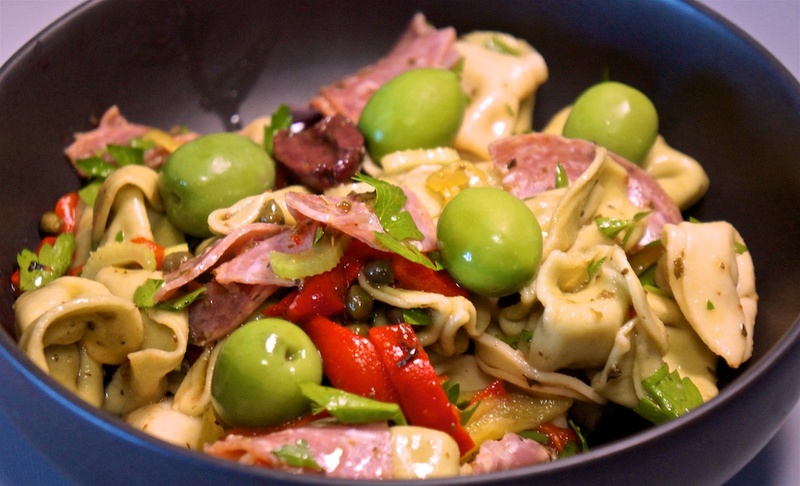 While we’ve had a Muffaleta Pasta Salad before, this was an interesting variation using Cheese Tortellini as the pasta and cheese components. It worked very well. Regardless of what the recipe says, this makes four serves. Add 25c per serve for seasoning and oil. Dinner tonight worked very well and was $4.71 per serve.